Through the Looking Glass: Is there a Market for Eyeglasses in Rural Sub-Sahara Africa? An estimated one in three people worldwide – so 2.5 bn – are in need yet do not have eyeglasses. About 80%, i.e. the large majority of those in need are found in the Global South particularly in rural areas. What is more, with the penetration of smartphones and tablet computers, refractive error and thus the need for glasses is on the rise. Specialists anticipate a 20% increase by 2020. If this is true, there seems to be a large unmet demand for eyeglasses in the Global South, and the key question is why nobody there is wearing them. Particularly also because eyeglasses can have sizeable economic impacts. In an RCT with tea pickers in India, for example, researchers found a productivity increase of 39% due to eyeglasses. Are there no glasses available? Are they not able to pay? Are they not informed? In our latest paper, we look into these questions using an original willingness to pay (WTP) experiment. We conducted the experiment in Burkina Faso, one of the poorest countries in the world. For the study we purposely selected 21 out of the 71 villages in the municipality of Kaya in the Centre North region of Burkina Faso. The region was selected because it is currently underserved by opticians and poverty levels are high. Hence, the experiment was operated in a highly resource constrained environment. In the region, the 21 villages visited were purposely selected based on their location, accessibility and previous NGO interventions. In each village we offered free vision screenings and conducted a Becker-DeGroot-Marschak (BDM) bidding game (see below) with those in need of glasses. In light of the resource constrained setting in which the study was conducted, we combined the BDM mechanism with two treatments to look into the question how information and liquidity constraints – arguably two of the most important constraints in a deprived setting – affect the willingness to pay. Participants were randomly assigned into one of four groups: A group which watched a three-minute video prior to making their bid, a group that was offered a deferred purchase option, a group that received both treatments and a control group who received none of these treatments. For the study we have a total sample size of 412 participants. We revisited a sub-sample of the participants that had purchased the eyeglasses following the biding game six months later in order to see if and how the glasses have been used. In the BDM experiment participants make a bid for the product but can only purchase the product if the stated price is at or above a randomly drawn price. Thus far, there are only few studies that have used the BMD mechanism in the field. This approach has a number of advantages over alternative methods as it provides an incentive compatible measure of the maximum willingness to pay. It is also a credible measure of the consumer’s expected utility associated with purchasing the product and provides more precise, high resolution data on the households WTP compared to a take it or leave it approach, which provides only WTP bounds. Following the BDM game, to avoid social tension, we drew the prices to be paid at the village level. The market price for the eyeglasses used in the experiment is 5,000 FCFA (8.6 USD). In our set-up the eyeglasses were highly subsidized and sold between 400 and 1,500 FCFA (between 0.7 and 2.6 USD), yet participants were not aware of this price range when making their bid. Furthermore, participants did not have priors about the cost or market price of the glasses. The willingness to pay for eyeglasses is low. Yet, information sells. The results of our study show that in our setting the median willingness to pay for eyeglasses amounts to 1,000 FCFA (1.75 USD). This is equivalent to 20% of the current market price of 5,000 FCFA. With respect to the competitive price, this is low and does not even cover the current production costs of the eyeglasses. The low willingness to pay however is consistent with the evidence from other studies analysing demand for preventive health products in comparable settings (Ahuja et al., 2010; Berry et al., 2018). However, it is important to note that compared to the average monthly per capita income of the study population the stated willingness to pay is large. It represents 28% of their average monthly cash income. 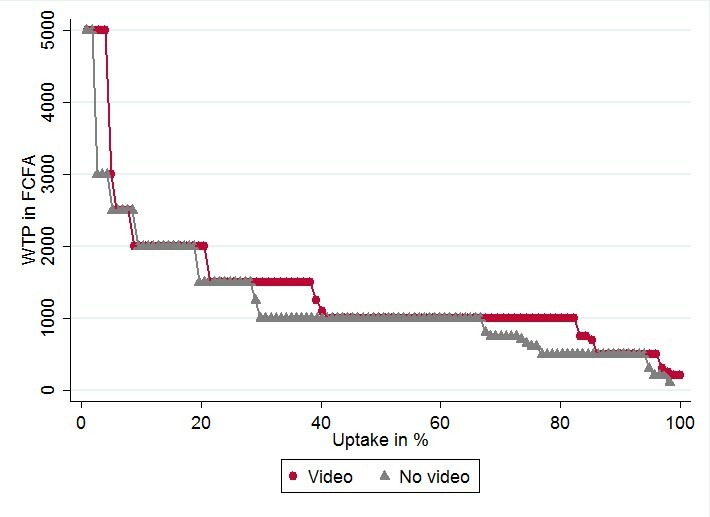 While we do not find any effect of the deferred payment treatment, those who have seen the educational video show consistently a higher willingness to pay (Figure 1). The effect of the video intervention is sizeable. Estimates show an increase by 16%. Based on the data from the six-month follow up, individuals with a low willingness to pay do not exhibit a lower use intensity. Likewise, those that have paid a lower price are also not less likely to use them. Most pertinently, after six months participants do exhibit a significantly higher willingness to pay. The average willingness to pay amounts to 2,700 FCFA compared to 1,500 FCFA that those revisited reported at the initial sale, representing an 80% increase. There is little doubt that people irrespective of their location should have access to eyeglasses to cure defective vision. However, how this can best be achieved is still an open question. Our study is based on a selective group of participants. Hence, the results presented in this paper are not generalizable. Nevertheless, they provide first and valuable insights on how to address the need for vision correction in developing countries. • Can the market alone address the problem or is there a need for subsidies? The results of our study suggest that in highly resource constrained settings, eyeglasses will indeed have to be heavily subsidized to reach high levels of coverage. Based on our study population, subsidies of 88% of the market price would be needed to reach 90% coverage. Providing users with additional information raises the willingness to pay and could thus reduce required subsidy amounts. Information campaigns however do also come with costs, which have to be considered in the cost-benefit calculations of large scale interventions. Speaking to the opponents of subsidies at least at the micro level, we do not find evidence of market distortions in form of a lower intensity of the use of the eyeglasses due to lower prices. • How can products be marketed? Based on our follow-up survey, people are willing to pay more once they had the opportunity to test the glasses in daily life. Hence, in addition to video and information campaigns trial periods for eyeglasses could be an interesting avenue to market the product. A step-by-step approach could be another alternative, i.e. starting off with a cheap, basic model and upgrading to better ones in later sales. A more comprehensive debate on cost-sharing for eyeglasses, does not only need further insights on treatments to stimulate demand, such as micro loans and trial periods, we also need more evidence on the productive effects of eyeglasses. NEXT: Why don't we know more about the lives of people with disabilities in developing countries?